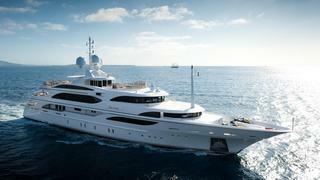 The 59.3 metre motor yacht I Dynasty, listed for sale by SuperYachtsMonaco and Merle Wood & Associates, has been sold. Built in steel and aluminium by Italian superyacht yard Benetti to a design by Stefano Natucci, I Dynasty was delivered in 2008 as a full displacement yacht built to ABS class and fully MCA compliant. In 2015 she completed a full repaint and extensive works at the Lusben facility in Livorno, Italy and is in immaculate condition. Accommodation is for up to 14 guests in six cabins consisting of a master suite, VIP suite, two doubles and two twins with two Pullman berths. All cabins have en-suite facilities. The main saloon has a large seating area and dining section. Forward of this area, in the main foyer, there is an elevator that provides access to the lower guest cabins, the gymnasium and the sun deck. The sky lounge is located on the upper deck and includes a bar, games table, a large screen for movies and a raised seating area for relaxing. On the sun deck there is an air conditioned gym with a separate sauna. She has always been privately used and never chartered, while her twin MTU 16V 4000 diesel engines give her a cruising speed of 15 knots and have logged only 3,200 hours. She also boasts those indispensable extras — zero speed stabilisers. I Dynasty was asking €29,500,000.